Rupert Ashby is the author of Izzie, the novel about a young girl growing up on the waterways of southern England. About the story: In the years before World War II, Isobel Horne is a boat girl with a burning ambition to learn how to read. Encouraged by her mother, she is enrolled in school. But war and tragedy turn Izzie’s life upside-down and almost put a stop to everything. But in the end, her ability to read becomes more important than she could ever have imagined. Rupert is better known in his home city of Peterborough as Derek Harris. 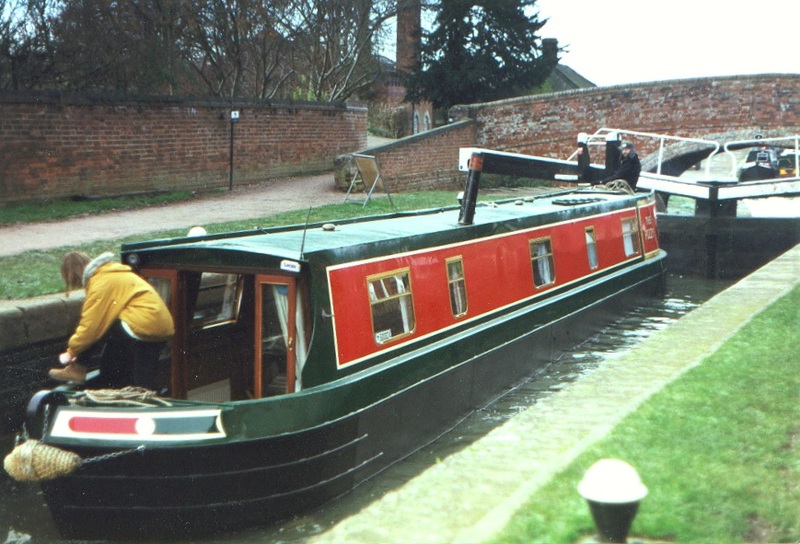 He sails a narrow boat himself and is a local authority on the canals and their history. For about fifteen years, Derek (as I must call him) has been giving entertaining talks to local groups about his favourite subject. He has also written and published a number of short stories. Bookheathen: Hi Derek. Thanks for talking to me, and welcome to my blog! The first thing I want to ask is about the rather unusual sub title to your novel – ‘A Child of the Cut’. Can you explain that to us? What exactly is the Cut? Rupert Ashby/Derek Harris: The Cut is the canal. The boating fraternity rarely, if ever, used the word ‘canal’. Their water highway was away the ‘cut’. BH: We tend to take education for granted today – even tertiary education. Perhaps we undervalue it. It wasn’t always like that, was it? RA/DH: In the early days of education students had to pay for their schooling. Boat children ‘slipped through the net’ of the Education Acts as they were never in one place long enough for a thorough education. Some schools were happy to take boat children for a few days at a time while their parents were waiting for orders and some boat companies ran their own schools. BH: I know you have a lifelong interest in the English canals, and have been giving talks about them for about 15 years. What made you decide to write a novel about them? RA/DH: I’ve always enjoyed what these days is called Creative Writing. Back in my junior school days it was called Composition and it was my favourite lesson. I never expected to win a prize for literature, but when I get an idea for a story I find it won’t leave me alone until I have, at least, started to write it. One day, I decided to set one of them down. Izzie is the result. BH: What drew you to the character of Izzie? Was she based on a real person? RA/DH: No, Izzie is a figment of my imagination. She is a composite character based on what I’ve read and learned about children’s lives on the boats in the 1930s and 40s. BH: How about the other characters, for example Izzie’s parents, Bill and Maggie – or George and Jean? Are they real people or types? RA/DH: All of the characters in the book are inventions with the exception of Mary Ward. They are, indeed, types who I think are representative of the diverse waterway community. BH: You’ve put at least one real person in the story – Mary Ward. Tell us about her. RA/DH: Sister Mary Ward lived in a canal-side cottage at Stoke Bruerne in Northamptonshire as a child. Her career as a young woman involved working at various convents in mainland Europe that specialised in the care of the sick. On her return to Stoke to look after her elderly father, she renewed her acquaintance with the boat families and became, to all intents and purposes, their doctor, often paying for their medicines from her own money. After many years service the Grand Union Canal Company put her on the payroll. BH: Tell us a bit more about the world of your characters. How important were the canals to the British economy? RA/DH: In the late 18th and 19th centuries the canals were vitally important to the industrial growth of this country. Without them the Industrial Revolution could not have happened. They were the motorways of their time. Canal people kept themselves to themselves, often distrusted by the folk ‘on the bank’. BH: Did the canals have any special importance during WW2? RA/DH: By World War II the canal trade had largely disappeared, having gone to rail and road. But the war gave a short lived boost as there was an increase in the volume of goods needing to be moved. BH: Izzie’s father didn’t want her going to school. Why not? How typical do you think his attitude among the boat people? RA/DH: Bill Horne has the traditional boatman’s view of education. He never needed it and so no-one who works the boats would ever need it. Being a ‘scholar’ was viewed almost as being disloyal to the boating trade. BH: Great things from small acorns, they say. Without giving too much away [no spoilers, please, Derek! ], can you explain the importance of Izzie’s schooling to the resolution of the plot? RA/DH: Her schooling enables her to read an item in a newspaper, which leads on to proving to her father that he has been duped, and could go to prison as a result. BH: It’s often said by critics that too much dialect puts people off. You have used quite a lot of it in your novel. How did you go about researching the speech and manners of the period? RA/DH: There is, indeed, a lot of dialect, but I thought this was important to reinforce the identity of the boat folk. Having heard numerous original recordings of boat people from the Grand Union, I settled on a kind of (diluted) West Midland accent for my characters. BH: Today, we have motorways and huge trucks to carry goods. The canals are mainly about leisure and pleasure, aren’t they? Are any of the waterways still in use for the transport of goods and, if so, what? RA/DH: There are still some boats trading on the canals but it is very localised. Mostly they are selling coal and wood for burning to other boaters. BH: Are you planning to write another novel about the Cut? Or about Izzie? RA/DH: I have also published a book of four short stories, all with a canal theme, entitled The Lure of the Cut, and have started working on a sequel to Izzie. Boat children! I had a few of those in my class as well during primary school. They came and went, but I can still remember their names to this day. What a lovely, interesting topic for an interview! Definitely. I am literally surrounded by rivers and there’s so much traffic there every day, having to wait for the bridges to close down again and such. Most of them transporting goods.